Well, this is quite a baking book. Starting off with the first thirty-one pages, which contain some of the most profanity laced – and best – advice I’ve read about baking. (Hmm, maybe I’ve been doing it all wrong.) But I couldn’t put Robicelli’s: A Love Story with Cupcakes down as I read through the fore matter, which the authors admonish that you’d better read because they “spent the better part of two freaking years” writing it because they “don’t want you jumping in like a lunatic and do(ing) something stupid.” Fair enough. So it’s a good idea to drop any reluctance you have to strong language – and cupcakes – if you want to enjoy this book, which I couldn’t put down and is truly laugh-out-loud funny. After dropping a number of f-bombs, the Robicelli’s warn you right off the bat that you’re probably thinking that cupcakes are stupid. And they agree with you, that many cupcakes are. But they make their case saying cupcakes are basically individual-sized versions of cake, which they say is one of the top five things in the world. And everyone likes cake – so why the hate? You won’t find any red dye, blue frosting, or cupcakes sprinkled with glitter in their book, or apparently, at their bakery. And perhaps the best line in a cookbook for this year is on page 15, talking about butter, and staving off all the people who want to substitute something else – “If you’re looking for a way to make a healthy, low-fat dessert, try eating a peach. Those are delicious.” Good advice! Being Brooklynites, they don’t take getting dismissed easily and the several pages that make the case for cupcakes is a pretty strong argument in their favor. But they don’t just love baking cupcakes; the book is subtitled “a love story” because in addition to discussing how they arose from tragedy, after 9/11 (Matt was a FDNY paramedic who sustained an injury during that time), the book goes off in a number of directions, recounting the fun, and the difficulties, of finding love and opening a bakery together during a particularly economically challenging time. And how they ultimately succeeding by creating an adult kaleidoscope of cupcake flavors that are distinctly different from what one thinks of when it comes to cupcakes. I won’t repeat their reason why you shouldn’t use artificial sweeteners (because it made me kind of queasy), but I was won over to their way of baking instantly and found their humor truly original for cookbook authors. There was a good number of the recipes in the book that I mentally bookmarked, but when I landed on the Chocolate, Peanut Butter, Pretzel cupcakes topped with crushed peanuts and pretzels, and drizzled with chocolate, I hit the supermarket for lait fermenté (buttermilk) and pretzels, pulled out my muffin tins, and started baking. There are two frosting recipes in the book. One is a basic “American” frosting, and the other a French buttercream, which they swear (figuratively, rather than literally, in this instance) would be the best choice. So I whipped up a batch in my stand mixer. There are comic strips to help you through the process in the book, which is a pretty snappy way to make something look easier than it sounds. But you will need a stand mixer to make it. And it’s imperative that you swap out the paddle for the whip once you begin adding the butter, or you’ll be cursing your broken mixer. Cupcakes have hit France, as they have elsewhere, although most folks stick to the common varieties. And even though peanut butter isn’t a local favorite (French people eat peanuts as bar snacks, but peanut butter is generally disliked) – I was happy to break into my stash of it for these, to share with friends and neighbors. The recipe took more peanut butter than was initially indicated, but the Robicelli’s say to keep adding more, until you get the frosting to your liking. Adapted from Robicelli’s: A Love Story with Cupcakes by Alison and Matt RobicelliThe Robicelli’s gave a choice of French buttercream, or an American frosting, with a recommendation that the French buttercream is the better option for these cupcakes. It’s a little more involved to make it and since I’m always looking for any excuse to use my copper candy pot, I was happy to be given a chance to do so.The recipes make a lot of cupcakes – nearly two dozen. Because the recipe comes from a bakery, it’s hard to scale down recipes for home-sized portions. (Well, depending on your home.) If you don’t have neighbors or friends you’d like to give cupcakes to, you can freeze the baked cupcakes and the leftover buttercream separately for up to two months, and use them at a later date.Before making the recipe, check the notes at the end for a few extra tips. 1. To make the cupcakes, preheat the oven to 350ºF (180ºC) and line two 12 cup muffin pans with cupcake liners. 2. Mix the cocoa powder and hot coffee together in a medium bowl, stirring until it’s a thick paste. In a separate bowl, stir together the buttermilk, oil, vanilla, egg, egg yolk, and salt. Gradually stir the buttermilk mixture into the cocoa, mixing until smooth. 3. Sift together the flour, sugar, baking powder, and baking soda. 5. Bake the cupcakes for 20 to 25 minutes, until the centers lightly spring back when you touch them. Let cool completely. 6. To make the peanut butter buttercream, put the water, sugar, corn syrup, and cream of tartar in a heavy, nonreactive saucepan fitted with a candy thermometer. 7. Put the egg yolks and the egg in the bowl of a stand mixer fitted with the whip attachment. Turn the mixture to high speed and let whip until the eggs become thick and hold their shape. When the sugar syrup reaches 235ºF (113ºC), turn off the mixer, add the xanthan gum, then turn it back on. With the mixer on medium-high speed, rest the syrup pot against the side of the bowl and gradually pour the syrup into the eggs in a slow, steady stream – making sure to aim between the sides of the bowl and the whip. Do not pour too fast, or you’ll scramble the eggs. 9. Continue beating and adding the butter until it’s all added and smooth. 10. When done, switch the speed to low and add the peanut butter, salt, and vanilla. Taste, and add more peanut butter a tablespoon at a time, if desired, until the right taste is achieved. You can add more salt as well. 11. Spread the buttercream thickly over the cupcakes, or pipe it in mounds over each cupcake, using a pastry bag fitted with a large plain tip (1/2-inch, 1,75cm), then refrigerate the cupcakes for 20 minutes. If you don’t use it all, see the notes for freezer storage. 12. 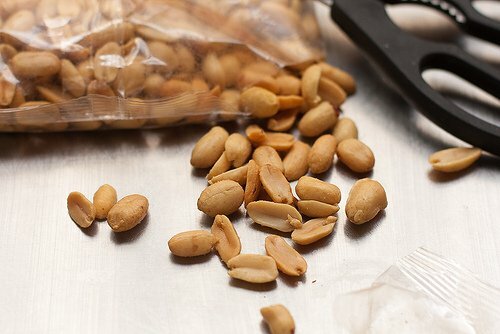 Pulse the peanuts and pretzel pieces in a food processor, or crush in a ziptop bag with a rolling pin, just enough so there are a few bigger, unruly pieces, here and there. Dump the mixture into a bowl and press the tops of the cupcakes in the pretzel mixture; if it doesn’t stick well, let the frosted cupcakes sit at room temperature to warm up a bit. 13. To make the ganache, warm the cream in a small saucepan until almost boiling. Remove from heat and add the chopped chocolate. Let sit 2 minutes, then stir until smooth. If it’s too thick to drizzle, add a touch more cream to thin it out. Use a teaspoon to drizzle the chocolate ganache over the cupcakes. Serve the cupcakes at room temperature. 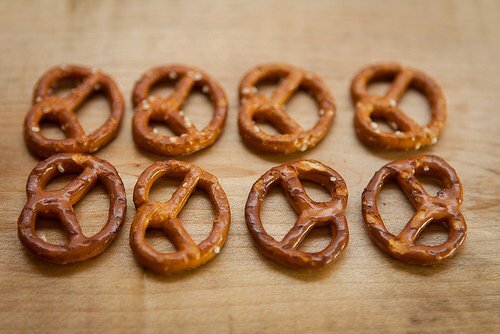 You can chill them for up to a day or two before serving, although the pretzels on top will soften. If you plan to refrigerate them for 1-2 days, frost cupcakes the cupcakes and chill them, then dip in the peanut-pretzel mixture the day of serving. Notes: The Robicelli’s recommend that you use “European-style” butter in their French buttercream, which has a higher fat content than regular butter. A number of brands in the United States make European-style butters, which are available in supermarkets. And, of course, there are brands imported from Europe, such as Kerrygold. I dialed up the amount of peanut butter in the buttercream. If you’d like it even more peanut buttery, you can add more, until you’re satisfied with the flavor. I had a good portion of peanut butter buttercream leftover. (The Robicelli’s are more generous than I am.) Additional buttercream can be frozen in a ziptop freezer bag for up to 4 months, and used to ice a batch of brownies, a loaf cake, or a future cupcake project. The authors mention that if you add the butter too fast, it can curdle. That didn’t happen to me but they advise if it does, turn the mixer to medium-high speed and add bits of butter, piece-by-piece, until it comes back together. Natural peanut butter is available in natural food stores and well-stocked supermarkets. “Natural” refers to peanut butter than doesn’t have additional fat or oil added. If you don’t have natural peanut butter, use commercial peanut butter, and realize that you’ll need to add more – to taste – for additional flavor. To tell if your cocoa powder is Dutch-process, it will either say so on label, or an alkalizing agent will be listed in the ingredients. For more information, check out Cocoa Powder FAQs. The xanthan gum is added to their buttercream to help stabilize it. I don’t know if it’s entirely necessary (I’ve never added it to buttercream I’ve made before.) So if you don’t have it, or can’t find it easily, you could probably omit it. (You can buy it at natural food stores or on Amazon.) If you do try it without the xanthan gum, let me know in the comments how it works out. I got a little OCD with the pretzel-peanut mixture and sifted it through a mesh sieve to remove any small nut dust and crumbs, for a neater appearance. 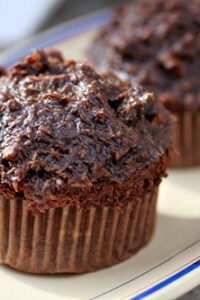 To avoid being left with smaller pieces for the last few cupcakes, give the mixture a stir between dipping the cupcakes. They look awesome! 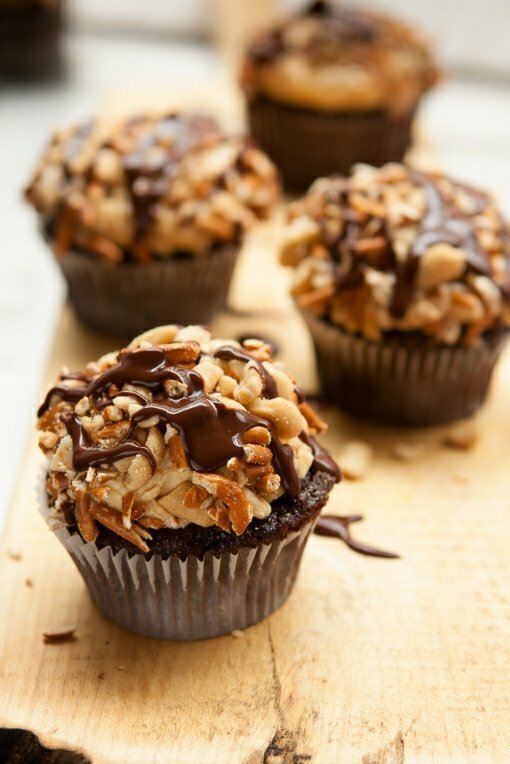 Peanut butter, pretzels and chocolate combined in a cupcake can be nothing less than amazing. Loooove these! They’re so pretty! I am curious as to what they actually said about artificial sweeteners. As much as I am aware of their disadvantages, my health would quickly deteriorate without them. To turn around and put 1 ¾ cup of refined sugar in a recipe doesn’t seem like a terribly good thing to do either. Definitely adding to this cookbook to my wishlist, sounds like a great read! And the cupcakes don’t look half bad either! These look divine!!! I am not too keen on vegetable oils (mostly since 99% of all vegetable oils in N. America come from GM crops) so is there a way to make the cakes with butter? I understand how oil works in cakes, and sometimes it IS the better option, but since I can’t add olive oil to sweet cakes, how much butter can I use for these instead of the oil? Please, please and thank you!!!! (and now I want the book; they had me at your comment “You won’t find any red dye, blue frosting, or cupcakes sprinkled with glitter in their book, or apparently, at their bakery.” – which is what I think ruined cupcakes for me. Spectrum organic oils are GMO free and widely available at whole foods and health food stores as well as Amazon. I need these cupcakes. I need this book. Is 8:00 am too early for these? Wow! These look amazing. I’m making a special trip to Brooklyn ASAP. these look wonderful. I havent in general been a fan of cupcakes, mainly for their heavy buttercream toppings but ideas like this, loaded with extra goodies sound wonderful. I have made French buttercream and have to say it is nicer and lasts better than standard buttercream. Yum! 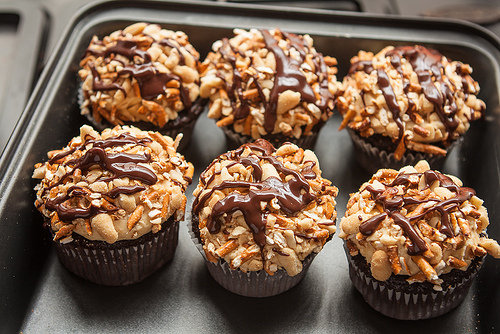 Peanut butter and chocolate are perfect together and the peanut/pretzel topping sounds amazing! I will have to look into this cookbook – sounds hysterical! Love this combination, looks so good – may have to use the topping on some muffins. I took it myself. It took a few tries, but (fortunately!) didn’t have any mishaps…or misses. I’m not entirely sure of the nomenclature but I believe it’s “French” buttercream because of the egg yolks, which enrich the buttercream. American buttercream often refers to a buttercream made with powdered sugar and butter as a base. Smooth peanut butter or chunky? Re: the commenter who wanted to know what to substitute for GM vegetable oils. I literally just finished making (and eating) a batch of no-bake Chocolate, Peanut Butter and Pretzel squares, so this recipe is right down my street. Thank you! Also, you have made my life so much easier by pointing out that “Lait Fermenté” is the equivalent of buttermilk. I was under the impression that only “Lait Ribot” would do and this is very hard to come by down here in southern France. I haven’t been lured in by the cupcake mania which I have taken as just an excuse to eat too much buttercream. I’m completely revolted by red velvet. These look and sound like real cake gone decadent with the evidence quickly disposed of. Love the old fashioned combo of chocolate/buttemilk/coffee. Can’t wait to try them. Where do you find lait fermenté (as opposed to lair ribot), here in Paris? David, do you ever just make buttermilk out of milk and lemon juice? Is the result really buttermilk? My Mom used to do this and insisted that it was (and it makes a mean pancake) but I dunno. David, you’re right – I often don’t see peanut butter flavored desserts in Paris! I personally love peanut butter, but I guess that’s what growing up in America will do to you. Also, I’ve noticed peanut butter isn’t the most common grocery item to find and is more expensive in France than it is in America, so maybe that’s why not as many Frenchies feel encouraged to bake with it! I saw these this morning while scrolling through my Feedly and I knew I had to make them ASAP. I just finished and they turned out fabulous. The buttercream is amazing!!! I think it is the best frosting I have ever made. I came out with 20 cupcakes here. And I reserved half the buttercream before the peanut butter to use for something else. Then I added actually the same amount of peanut butter the recipe calls for to the remaining buttercream, it tasted perfect. There was plenty of peanut butter buttercream for my 20 cupcakes. I did not use the xanthan gum and as far as I can tell there is no difference. I am taking them to a party tonight so we will see how they hold up. Just ordered the book off amazon! I love your blog, David, but these cupcakes are just too, too much. Overkill. Sorry. WOW! Looks delicious. My family would go nuts from the combination! Thank you David. Another one I will try. Thank you for sharing. You do have a typo. Step 8 in buttercream, third sentence . Should be butter instead of button. I’ll never understand why writers think they have to dumb down to the level of profanity, when we all need a bit more softness and civility. So I’ll pass on their book, but I appreciate your sharing a recipe with us. And I appreciate your civility (and entertaining knowledge), David. Well stated! I am disappointed to see profanity in cookbooks. It’s just not necessary; just lazy and uncreative. Cupcakes for adults – definitely! Love the combo of peanut butter + chocolate + pretzel; I’ll be making these soon! Hey, anything that involves paddles and whips I’m all for. :-) (Re: your stand mixer instructions.) But seriously, this is a combination of flavors I have seen in several recipes now and I really need to try it. These look beautiful. I loved the sound of this book until I got to the recipe and saw corn syrup. No. Charlotte: You can use either (I used smooth) – if you use chunky, you might not be able to pipe the buttercream on, in which case, I’d use smooth. Margot C: Yes, you can do that as well. I do like to buy buttermilk because I’m one of those rare people that likes to drink it, too. 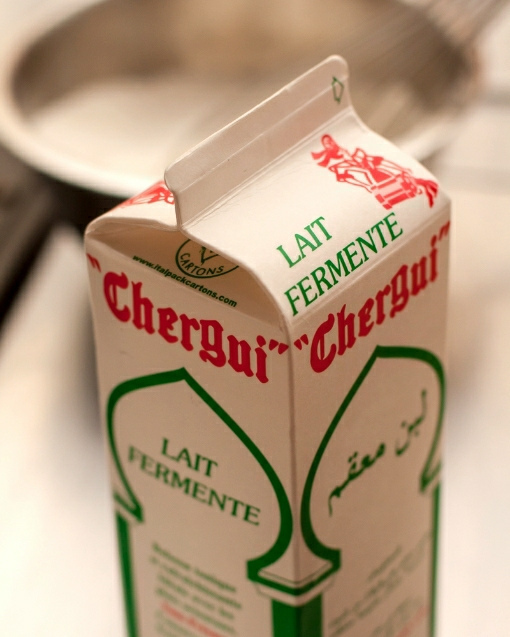 Aaron: Most Arab épiceries have it – sold as lait fermenté, but they do also sell it at my local Marché U and Dia as lait ribot. Alas I don’t have a stand mixer. Would this buttercream be impossible to make with a hand mixer? Thank you for the recipe – as all you post I just want it and want it now….. Sounds like a brilliant book. Love anyone who approaches anything with such candour and passion. And love that they give you two options for the icing. Shows that they take their cupcakes really seriously. I take it that this is a story of their bakery and their life with recipes added. The warning about the profanity should suffice. Those who can’t bear it can skip it. And those who cannot eat rich food – for whatever reason – can eat a peach. Some things can be altered to suit special tastes. As a rule I have found that baking cannot as it is as much science as art. These sound labor intensive and delicious. Because of the pretzels, which should be crisp for full effect, they don’t sound like something to be held for too long. Re Barbara, having made buttercreams for years, I’d say that a hand mixer just won’t be powerful or stable enough. The stand mixers provide both power and stability for heavy mixtures. Thanks for all you do, David….I especially enjoyed the OCD note at the end. I’d have been troubled by that dust and tiny bits, too…and the uneven distribution of the goodies as the cupcakes were dipped in that mixture. We are funny ducks, but lovable. I was laughing out loud while reading the part about eating peach instead of trying to make this recipe healthier. I will give this recipe a try. Merry Christmas David! PS. I have placed a hold on this book with my public library. Should have it in a week or so. Looking forward to the fun and the recipes and will self-censor as needed. Wish I would have paid attention to my friend Lynne who told me about you when we were in Paris this summer for three months. Great blog, and I’ll be following from now on. Love cupcakes, and will be getting this book. Thanks for the fun! Peanut butter, pretzels and chocolate. What a lovely combo. Gorgeous cupcakes and great sounding book. I made these today to bring to a party. Of course I had to taste one and they are fabulous. I was nervous pouring hot sugar syrup into egg yolks, but it worked beautifully. You scared me in Step 7; you said to “gradually pour the syrup into the WHITES in a slow…” The recipe called for the yolks. Then in step 10, you say to add the peanut butter, salt and vanilla. There wasn’t mention of vanilla in the ingredients. I didn’t add the vanilla. Also, I didn’t use xanthan gum and they came out fine. I am not a cupcake fan (I know, boo!) but I am definitely making these! Thanks for the recipe. I always trust your taste and recommendations. However, I am so done with the “f bomb” as a (less than clever) means of expression and I refuse to keep enabling its useage in my daily life. Cheryl: Yes, it’s added to the eggs (yolks & whole egg) – I clarified that in the recipe. Glad you liked it and thanks for the heads-up on the xanthan gum. Bebe: I just think that people who aren’t expecting to see them in a book might be unnerved. With folks ordering books online more and more, often people don’t leaf through a book before purchasing it. So I like to give a heads-up. 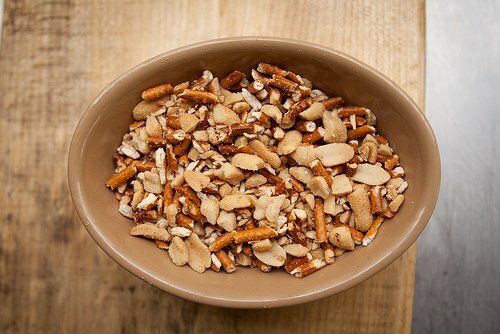 Glad that we share a love of uniform pretzels and nuts! Barbara: Yes, I would not recommend using a hand mixer for the buttercream. Most aren’t strong enough to handle the task. Well, here I am – back after picking up the book at my public library yesterday. I was surprised that the profanity belongs primarily to Allison Robicelli, who was the principal author of the book. Notes from husband/chef Matt are inserted throughout. She is apparently a comic of some sort and a pretty foul-mouthed one at that. Oh, well. 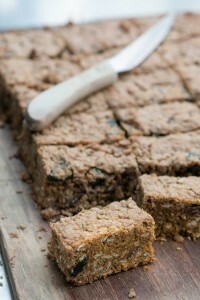 The recipes are challenging – even the ones rated with only one wisk (they go up to at least 3 whisks in difficult) but they explain the techniques thoroughly and also tell the reader why they use certain ingredients. The cookbook will be fun for some. Others can heed David’s warning and mine. Simple. Or wade on through and figure the recipes are worth it. David, do you tap the nut dish (especially cashews) to get the bits to go to the bottom and the nice big fat ones to rise to the top? OCD can be fun. Sounds like a great recipe and a great (and entertaining) cookbook. I will have to look for it. Have you ever read the blog Thug Kitchen? They have a similar humor that I enjoy! Regarding olive oil in this cake: Aside from choosing an EVOO for use in cakes, LOOK on the bottle for the ACIDITY. There is almost always an acidity %age. Most EVOO has an acidity of 0.8% but for baking I use the lowest I can find – 0.4% or 0.5%. There is a difference! The color of the oil is also a hint of its blandness – the paler the color the lighter the flavor, usually. Keep in mind that there are delicious recipes for olive oil cakes with no competing strong flavors to mask it, especially Mediterranean recipes. SO use olive oil in your cakes without concerns. The authors of this book recommend canola oil. They specifically do not recommend olive oil, citing its strong taste. In this recipe you mention as an alternative, an American Peanut butter frosting, but I don’t see a recipe for it listed here. I would love to try these, but even dividing these cupcakes among 3 or 4 friends and neighbors, 6 sticks of butter in a buttercream is, as someone else said, a bit too much, even if there is leftover to freeze. If you have a Peanut butter frosting made with confectioners’ sugar, can you please post? Whenever I see a recommended oil in a recipe, I must admit I ignore that and use whatever oil I want. Canola oil [which is really rapeseed oil] used to be touted as particularly healthy but currently there is evidence that monosaturated oils have a lot of benefits and complement the health benefits of polyunsaturated oils. So I feel that we need not limit ourselves to only certain oils publicized as healthier like Canola. My favorite oils for sweet recipes like cakes are actually nut oils. I love using hazelnut, walnut, almond, and macadamia oils in cakes. I also like palm oil which is more buttery. Since it is monounsaturated, even this oil is healthier than people used to assume. Anyway, it is consumed only in small amounts. There is one oil that has the highest level of vitamin E – rice bran oil and it also is successful for me. I read 1 academic article that showed that baked goods made with it will stay fresh longer b/c of the qualities of that higher vitamin E level giving better keeping quality. I have used olive oils often in cakes in recipes too. I cannot vouch for strong flavored or high acidity olive oils but the LOW ACID EVOO I use is always delicate and unobtrusive in the cakes. Don’t be afraid to try other oils! For a peanut and peanut butter addict, (not to mention the chocolate problem) these sound not just irresistible but distinctly dangerous! They’ll definitely have to go on the to do after Christmas list. 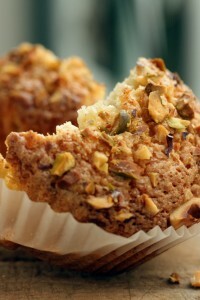 David — Thanks so much for this cupcake recipe – and for pointing me towards the cookbook! One question: What do you think constitutes a perfect “copper candy pot” that would be a good addition to a home kitchen? Thanks! Wow! These cupcakes have been a sensation with every one I’ve given them to. In addition, I had extra frosting and filled some chocolate macarons with it. DIVINE. I wonder why Pierre Hermé has never thought of that. Is it possible to give up on the whole cupcake idea, take only the buttercream and the topping part and to serve it as cookies? Will it going to stick together or fall apart? One thing about downloading books is that most publishers are learning to provide sample chapters for download, too. If there is no sample offered, then I understand people being affronted by the unexpected language, but when the publisher makes the sample available, it’s hard to claim shock and surprise anymore. Yeah, they curse like sailors. I’m not offended by that; I’m simply bored by it and think it shows a lack of imagination. If you’re going to go out on that limb, best to have something very, very solid to offer with it. I’m hoping their recipes are going to make up for the schtick of trying to be shocking and edgy. I am interested in getting this book simply for all the incredible work that the Robicellis did after Hurricane Sandy. Like organizing food and aid for all those who lost everything in that storm, even as they (the Robicellis) were struggling to get their own business re-opened. Their efforts were documented on Serious Eats. I’m also not a fan of profanity used as punctuation in writing, but from what I’ve read about the Robicellis, they’re definitely not trying to be shocking or edgy. I can overlook the language if the cupcakes are as good as people have been saying for years. Thanks David – these look amazing! And, I love a good f’n cupcake, so think ill check out the book. Un question – do I REALLY need a stand mixer for this? A little elbow grease won’t suffice? 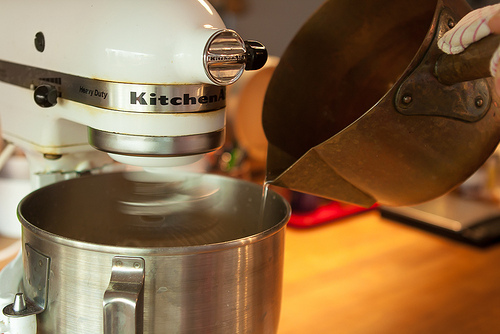 Unless you have the arms of Popeye, I would highly recommend a powerful stand mixer for making any kind of buttercream. They absolutely look gorgeous, the combination of chocolate & peanut butter tastes like heaven…. Just made the recipe and did not use xanthan gum and the frosting is perfect. Also since there was so much, I poked a little hole in the cupcake and piped some into the middle before frosting the top. Serving them tonight at a dinner party. i’m considering making this as a layer cake. do you think the buttercream would be too rich for frosting a whole cake? It would likely work fine!